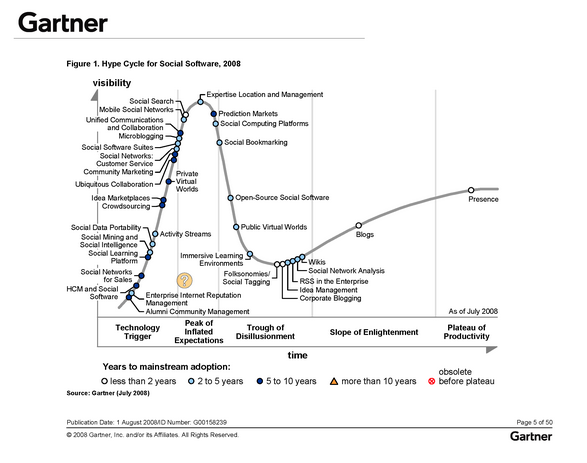 Many moons ago I deconstructed Gartner's hype cycle from the underlying market dynamics and demonstrated how it couldn't be based upon any form of physical measurement but instead the aggregation of analyst's opinion. 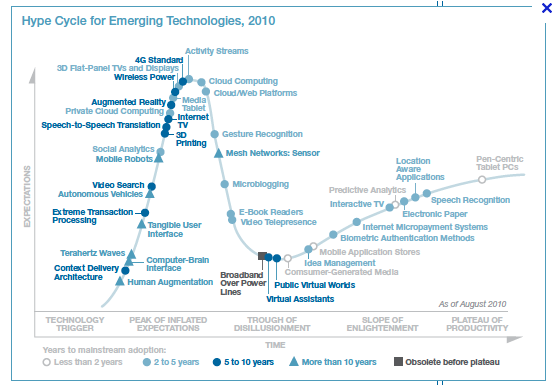 The effects of the hype cycle pattern appear real enough, just the hype cycle graph isn't some actual measurement of change just perceptions. As an aggregate of Gartner analyst's opinions this has some value if you assume analysts know more about the market than your own people. 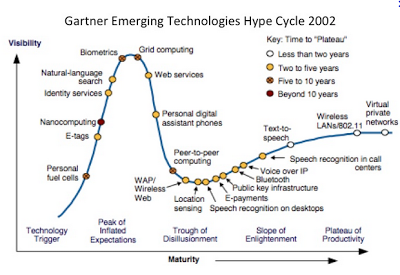 If not, then any large company should simply build their own hype cycles. However, that's not the point of this post. You could make a case for this being simple renaming as in Visibility and Expectation are the same. I have difficulty in accepting that. However my difficulty level reaches new heights with changing Time to Maturity as though the process of evolution (i.e. how something becomes mature or fit for purpose) had a linear relationship with Time. I know, I know ... the Hype cycle isn't "real" as in it's not a scientific measurement of a physical characteristic but instead it is just aggregated opinion and therefore I'm being petty. It's just a visualisation of perceptions and is obviously evolving itself. I understand all of this. It's just that it gives the impression of being actual physical measurement, a graph of something tangible that can directly investigated. Hence changing the axis drives me nuts. I should shrug it off and look forward to Expectation over Maturity (which they seem to have missed) and bizarrely enough is the pattern which appears to be most "real". Another story, another day. Loved this, shows your perspective perfectly! Been thinking about what the next Gartner axis title could be..
From 1995 (when Jackie Fenn first created it) to 2007, we had the Y axis labelled as "Visibility". 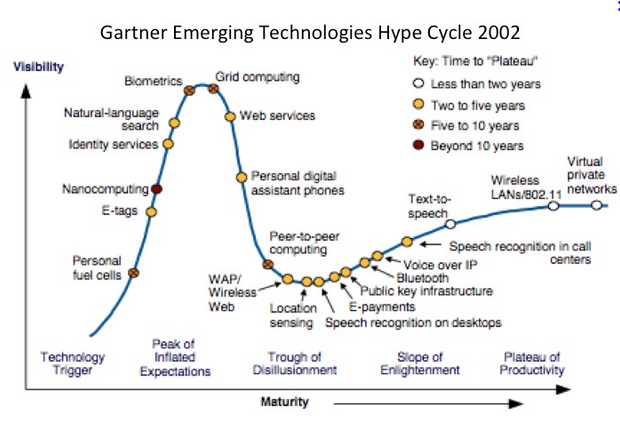 During work for our book about the Hype Cycle we reconsidered that. Visibility ( in the media etc.) is an indicator of the underlying factor: market belief in future expected value. So we relabeled to "Expectations". The X axis has always been time, but there have been occasions when versions of the chart have been mislabeled. Thank you for clarifying that. Much appreciated. 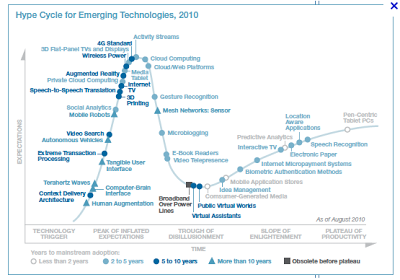 So, Expectation vs Time are the now common axis with expectation as what the market expects? Many, many moons ago I managed to model an expectation over time curve from basic principles in the hunt for the impossible, a way of defining how uncertain something was prior to it becoming certain. Anyway, I hope you find it interesting and thanks for clearing that up.